Thunder Lotus Games rose to fame with the hand-drawn animation in Jotun. 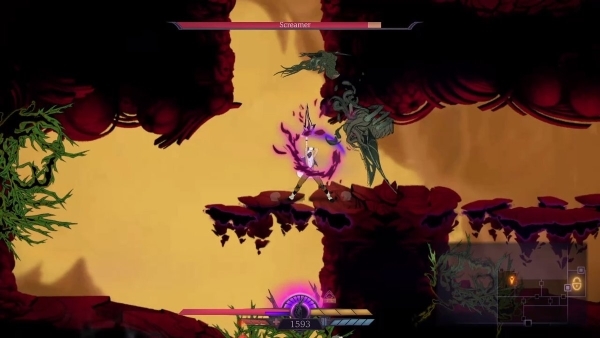 Now they have brought an enhanced version of Sundered to the Nintendo Switch. 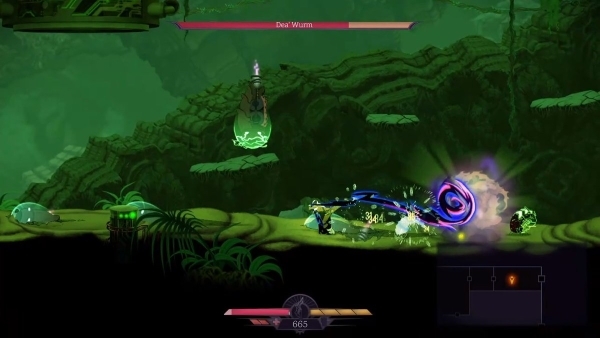 A Lovecraftian Metroidvania, how does Sundered: Eldritch Edition hold up? Read on to find out. In Sundered you must gather all the “Elder Shards” from an area by beating three mini-bosses, then defeating a real boss. The combined Shard can be spent to “corrupt” and enhance an ability you have unlocked, or thrown into an incinerator. Choosing to use or destroy the shards did not make a huge difference in difficulty to me (perhaps due to my second run being “pure”). While some obstacles are impassable without the corrupted skills in the short term (and therefore less money found), it is nothing more exploration cannot solve and you can still access all major areas without corrupting. 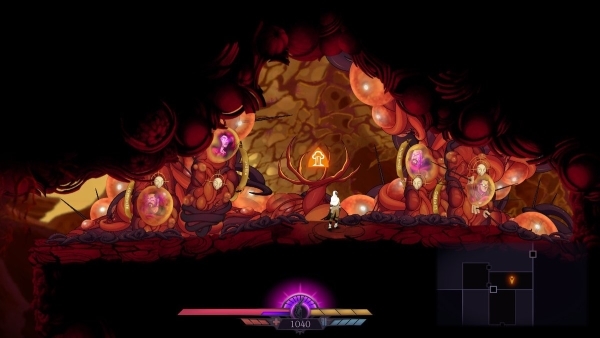 Sundered calls itself a Metroidvania, despite having a random map. Imagine a large open box between important areas (bosses, shrines where you gain new abilities, and so on). This “box” is then filled with random interconnected rooms. When you die these rooms are randomized again, while major rooms stay in the same places. It can be a double-edged sword. Random rooms are much less memorable than major rooms due to them having less puzzles and things to use abilities on. Some abilities are still useful in combat, and maneuvering around does become quite swift. Another issue is that the randomization is so subtle I rarely noticed it. Every object in the environment has a purpose- leaving little to no decoration. It is still pretty to look at, but after your first hour in an area things start to blur together. While being less memorable sounds damning, it prevents backtracking feeling as dull. Aside from giving you more chances to find money, the shuffle stops you running through old areas on auto-pilot. A few early abilities also make moving around the environment quite fast. The minimap is also excellent, with clear iconography. 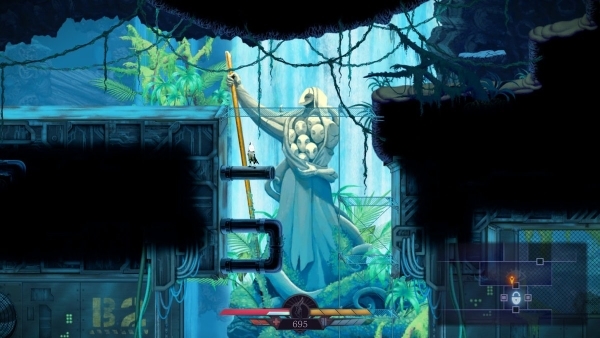 The developers knew retreading old areas could quickly condition players to associate boredom with those areas, and did something to counteract it. Yet the way they handled combat nearly associates it with annoyance. Combat against normal enemies is monotonous. Constantly attack while facing the right way, and most enemies will be hit-stunned until they die. Combined with the dodge roll’s generous i-frames (even if they are limited in a short time-frame), and a shield that can take a several hits before it cools-down, and you feel like a force of nature. Against large groups of enemies and bosses, you have to focus a lot more on when and where to dodge in an endless barrage of attacks. The game goes from one extreme to the other- a curb stomp or the Normandy landing. I felt these fights were a great challenge and I used several abilities in battle, but it may be overwhelming for some. 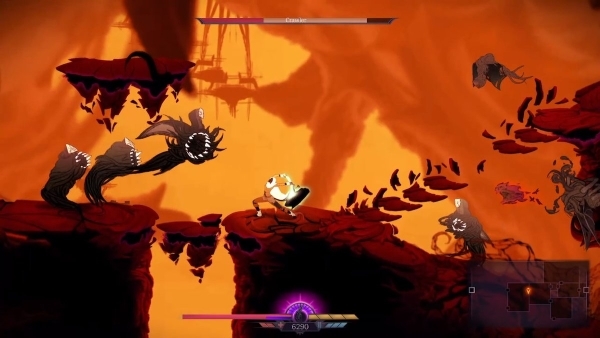 The issue is Sundered technically has no fixed enemy placement (aside from bosses). Instead, enemies appear as you move from room to room- essentially acting as a “boredom stopper” counting down when they should appear. As mentioned, the basic mobs are too few to be a threat, and happen infrequently enough to make some areas feel lifeless. If you flee, a lot of enemies can pursue you from room to room- some even shooting at you from off screen. You can even spawn additional enemies if you keep running. When you are unsure where to go, backtracking, or do not want to fight, this quickly makes basic enemies annoying. My initial reactions before the first boss were very negative. It is very necessary to kill everything however, as you need the cash to upgrade your stats. The skill tree is more of a “stat tree” where you can also equip perks which have a pro and con. Every stat “node” costs the same, but that increases with every purchase made. You really do need to break every object, kill every enemy, and seek out a few hidden chests so you can gain the stats to handle enemies later on. It’s a great way to prevent it from being unbeatable (if you’re prepared to grind), though the various “paths” on the tree have little synergy. Rather than a path focused on surviving or dealing damage, you get a mixture of stat upgrades- often leaving me to focus on major upgrades and the number of nodes it took to get to them. 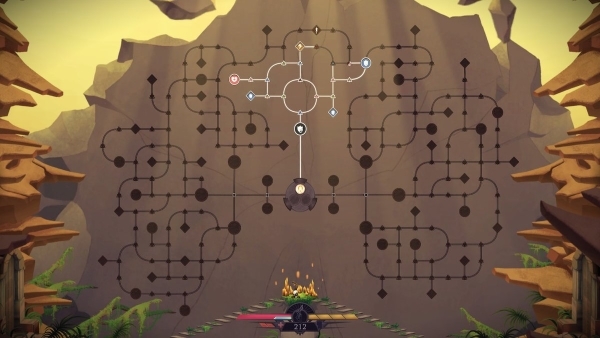 Sundered does not really have puzzles to navigate the environment, but the abilities you unlock get you around blockades and create shortcuts. The real puzzles come from the Magnate of the Gong update content. 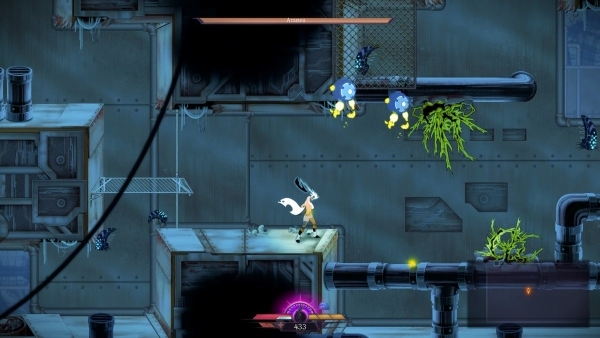 These are enemy-free puzzle rooms, brilliantly crafted to tax you. The reward for these is usually a shockingly hard fight (the puzzle is still solved if you die thankfully) and a true reward, but it makes me wish for more puzzles like that to progress, rather than “challenge rooms” off to the side. While the bad may sound like it outweighs the good, it really doesn’t. I happily carved up or danced around enemies, sought out money off the beaten path for upgrades, and opened up shortcuts. 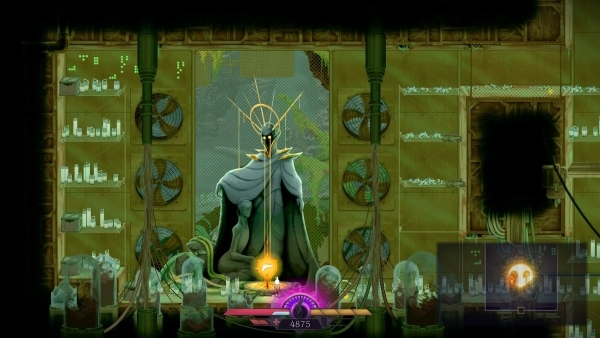 Sundered keeps the spirit Metroidvania, even if the puzzles are in the wrong places. 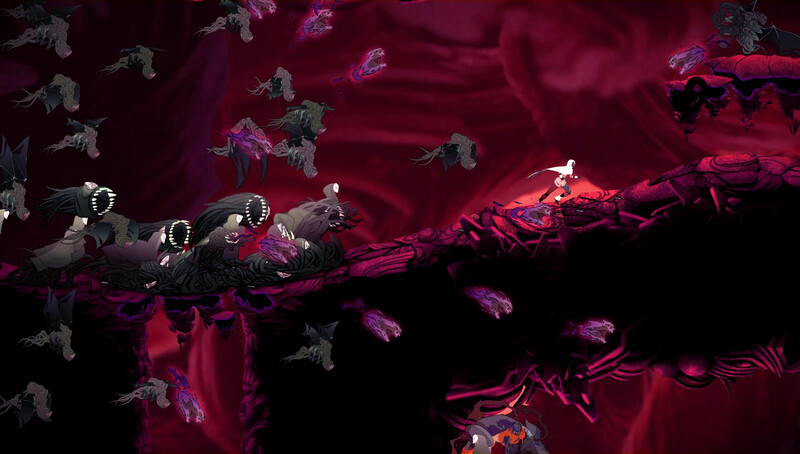 Sundered did have rare performance stutters; usually a brief freeze when approaching a new room. When this did occur, it was no more frequent whether I was playing the Switch docked or in handheld. I did have several crashes going into areas that had to load, this seems to have been fixed with updates. Sundered keeps its plot in the background, save for the occasional narration or text providing lore. Your character fell into the worst hole in the desert, and now an elder-god crystal is whispering that it can help you get out of the pit if you get the Elder Shards. 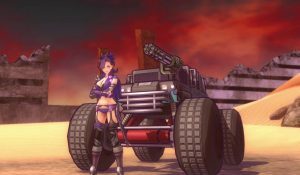 The plot is a suitable vehicle for the game, but the odd bits of world-building stop it being inconsequential. From small quotes on the skill tree, to the giant crystal giving a none-too-subtly-biased account of past events, you gain a glimmer of the world at large. You do get the odd major room specifically designed to have a nice object in the background, or dark balls you attack to earn narration. I understand why they were not placed in random rooms, but it does mean you have very little to pay attention to. Sundered has something akin to the typical Good/Neutral/Bad endings, depending on how many Elder Shards you use or destroy. Much like other games using that system, it does boil down to all-or-nothing. You can use all shards, destroy all shards, or get a neutral ending. This is not a negative for me, but it could be underwhelming to others. It essentially makes the neutral route feel lesser, and makes you wonder why you are given the choice after your first shard is used or destroyed. It will not be the next Dark Souls or Bloodbourne for hidden stories, but Sundered does provide enough to chew on if you go looking. Even if the only places you need to look are in major rooms and the skill tree. Like Jotun, Sundered is beautifully drawn and animated. The environment alone is stunning, albeit some areas are not terribly inspired. While they always look great, I almost dare to call some of them generic looking; the exception being the other areas and set-pieces like giant statues and shrines. The lack of flare is also due to nigh-everything being part of the game. Even in random rooms, some “decoration” hinting at the world at large would have been nice; something that is not a platform or interactable. While this is not a deal-breaker, small details had potential to make the environments something truly impressive. On the other hand, Character designs are amazing and well animated to boot. The eldritch monsters truly look like the indescribable terrors H.P. Lovecraft wrote about in works such as The Dunwich Horror; rather than the typical fish people or heavily contorted versions of something known. They are a writing mass of limbs that change their form to suit them. Sundered’s take on eldritch monsters is more original than games with a much heavier focus on the Cthulhu mythos. I would dare to argue Sundered exceeds Call of Cthulhu in monster design, and is almost on-par with Cuphead in animation. The tone Sundered sets through sound and music is interesting, albeit not scary. 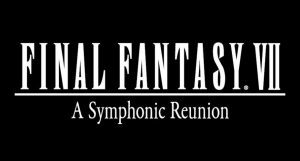 Unsettling music only plays during boss battles, but the ambient sound effects and the game’s style do have a slightly oppressive atmosphere. This is certainly not a “feel good” game, nor do you feel afraid or bitter-sweet. You feel isolated and lonely until enemies start to make ungodly noises, and it suits the game to a ‘T’. The eldritch language of the crystal is also note-worthy, as it sounds like a legitimate language. Ultimately my conflicting opinions settle that the few flaws the game has are worth enduring. Ignore the strange things and you will see a new world of maddening challenge. 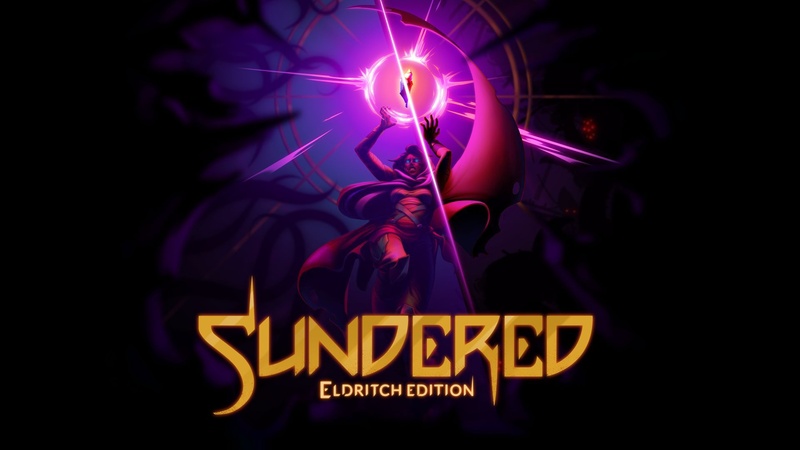 Sundered: Eldritch Edition was reviewed on Nintendo Switch using a review copy provided by Thunder Lotus Games. 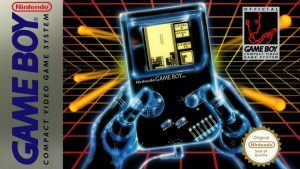 You can find additional information about Niche Gamer’s reviews/ethics policy here.